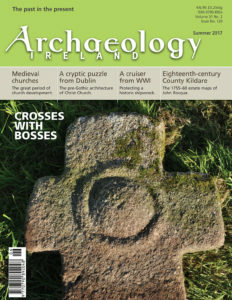 Lost, found and still to be discovered—this current issue of Archaeology Ireland throws light on new discoveries, old puzzles and answers yet awaited. A chance discovery of an apotropaic mark and concealed shoes during restoration of a timber-framed house in Dublin reveals active attempts to ward off witchcraft—a practice that reached its peak during the late sixteenth and seventeenth centuries. The unique remains of an apothecary’s shop dating from the mid-seventeenth century have recently been discovered during excavations in Dublin [Click here to read this piece for FREE]. The discovery of a stone cross with a central domed boss, with a probable tenth-century date, suggests an early medieval church at Ballyboys Upper near Valleymount, Co. Wicklow. Preliminary results of excavations conducted ahead of developments at Bay, Co. Dublin, a sparsely settled rural hinterland north of the city which had been farmland for millennia, reveals long and continued settlement not previously recorded on even the earliest Ordnance Survey maps. Even before the first Ordnance Survey, the great Anglo-French cartographer John Rocque compiled city and county maps. His estate maps of County Kildare provide a perspective on landscape changes in the county and an opportunity to chart the progress of enclosure in the low hills of south-east Kildare. Know Your Monuments focuses on medieval churches and highlights the great period of church development in Ireland from the opening centuries of the second millennium AD, while an examination of the puzzling pre-Gothic architecture of Christ Church in Dublin provides some surprising and interesting answers. Posing questions, with the answers still to be revealed, is the HMS Drake, recently designated as a scheduled historic monument, which will become a focus for understanding, exploring and appreciating the world of 1914–18 and the often-overlooked War at Sea. Questions also abound at Drumanagh, the large coastal promontory fort in north County Dublin, where future excavations may lift the veil on the enigma of the Irish Iron Age.